The atmosphere onstage crackles with the intensity of a final dress rehearsal. The actors pounce on their cues, feeding on their cast mates’ energy — by the last scene, the stark, dim stage practically thrums with it. One young actor strums his acoustic guitar at his autistic friend’s bedside, striving to cheer up the boy with a lively tune chronicling their friendship. In the previous scene, an angry moviegoer attacked the friend, misinterpreting the autistic teenager’s behavior as offensive. What’s remarkable about Rule Breaking isn’t just that it’s about autism — a topic rarely addressed onstage — the bigger surprise is that many of the cast members are autistic and are portraying fictionalized versions of themselves. The actors and production team developed the play as part of New York University’s drama therapy program, one of a growing number of programs in the United States to use live theater to help children with autism. Drama therapy has been used for years to help people cope with depression, anxiety and other psychological issues, but its use as a treatment for people on the autism spectrum is relatively new. While little formal research has been done to evaluate its effectiveness, a recent study suggests that theater-based intervention programs may improve social ability and facial recognition in autistic children. Traditional therapies like video modeling, in which autistic patients watch and mimic video demonstrations of specific behaviors, tend to focus on teaching specific social skills, such as the best way to start a conversation. However, many autistic children struggle to internalize these skills, and often have difficulty adapting them for different situations, Corbett says. Also, these programs rarely offer participants the opportunity to practice socializing with their peers in more lifelike situations. Programs like SENSE Theatre and the NYU Steinhardt Drama Therapy program try to offer a safe space for autistic children to practice this socialization. An autistic child in a drama therapy program can feel free to start a conversation with another participant without fearing exclusion or ridicule. Theater is particularly adept at promoting this kind of behavior, according to Corbett, because it demands risk taking and vulnerability while simultaneously encouraging openness and acceptance. In addition, the performers can rely on a prewritten script when words might otherwise escape them. 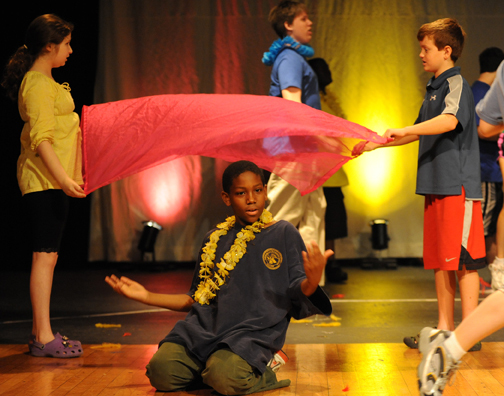 Children in SENSE Theatre perform together in full theatrical productions. The casts consist of about 30 members, ranging from ages eight to sixteen. Of that number, roughly half are autistic. The rest are actors trained to be sensitive to the needs of their autistic peers. The plays themselves, written by Corbett, are about 45 minutes in length and often include musical numbers. They explore themes relevant to children and teens coping with autism, such as acceptance and community, but rarely discuss autism specifically. Corbett’s research shows that children who performed in the plays became more confident in social situations unrelated to drama. When meeting new peers, they initiated more conversations and spent more time socializing in groups than before they started drama therapy. Those are crucial life skills for autistic children, according to Corbett. “We do need society to be more understanding and supportive of individuals with any disability, but at the same time, it is our responsibility to those individuals who want to participate in the social world to give them the necessary skills to be successful,” she says.